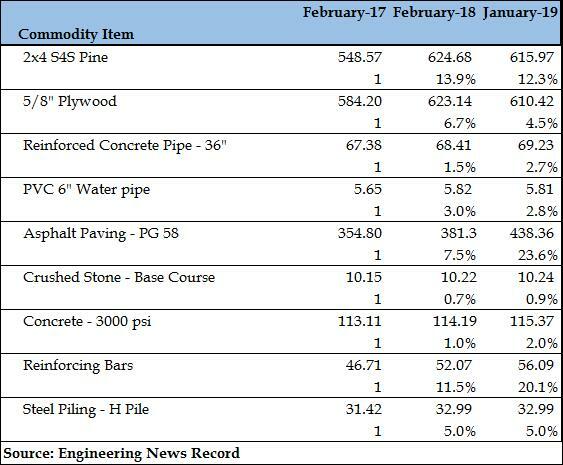 At the beginning of 2018, construction material suppliers were raising prices in response to the pending import tariffs. Quoted prices increased 20% to 30% for steel and wood products. Some of these were passed along to Owners as change orders and others caused project redesign. To determine the real impact one year later, I decided to review national pricing for key construction materials and was shocked by what I found. I searched for a reference guide that would be consistent among all construction materials and chose Engineering News Record (ENR) as my source. Each week, ENR publishes a 30-city average of pricing for select materials. A typical month will have four lists of common materials enabling an estimator to track pricing history. While ENR has tracked additional unit pricing, it is clear from the data that only two common materials reflected any significant increase. I also looked for any spike in the pricing that would indicate a reaction to the announced tariffs and found very little impact (for comparative purposes February 2017 was considered the base line = 1). 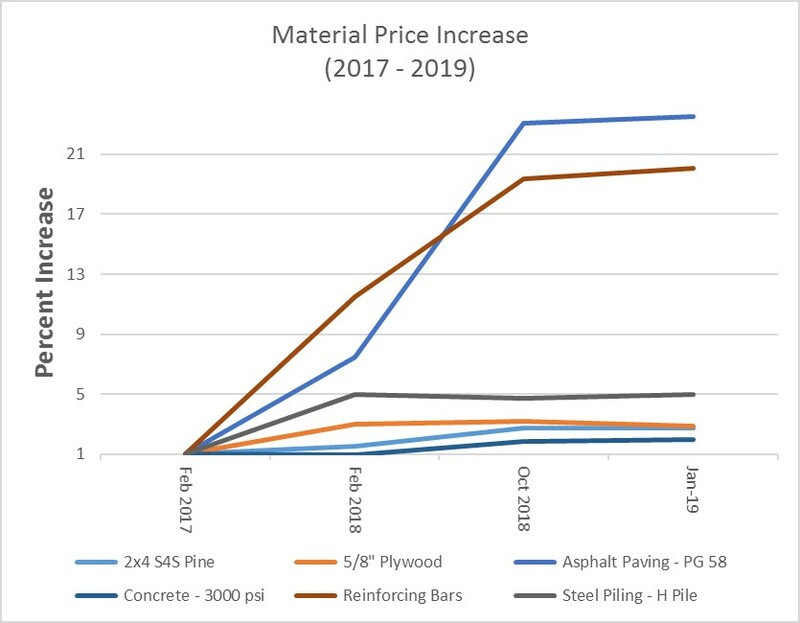 The data indicates there was an increase in pricing for several key materials; however the general trend was that once the increase was realized, the pricing remained level. Considering that the United States GDP increased approximately 6+% over the same period, the cost increase for most construction materials has remained fairly flat. Two exceptions are noted (reinforcing steel and asphalt paving). Curiously, it can be argued that the largest increases are for materials not related to imports. Asphalt is a petroleum-based product, and the United States is a net exporter of oil. Reinforcing steel is mostly melted scrap metal. Ten years ago, during China’s large building boom, they impacted the price of reinforcing steel by paying more for the US scrap metal than local manufactures. This is no longer the case. In addition, several of our projects were hit with perceived price increases for steel and based on the data, that increase is no longer supportable. Once again, we see the elasticity of pricing in the United States’ manufacturing industry and its ability to find its way around material pricing issues. For years we have witnessed that when steel costs increase, more concrete buildings are constructed and vice versa. Tariffs are just another pricing issue solved by American industry, and Owners should always challenge their contractors to find a less expensive product or method to accomplish the desired solution.